About the Author: A Separate Peace by John Knowles. Personal Background. Early Years. Education. Jobs. Literary Writing. Honors and Awards. Biography of John Knowles (1926-2001) from GradeSaver.com. "John Knowles was born in 1926 in Fairmont, West Virginia; at age 15, he became a student at Phillips Exeter Academy, a well-known boarding school in New Hampshire, not unlike Devon, the fictional school he writes about in A Separate Peace." John Knowles. Biographical Information, Critical Responses, Works Published, Selected Bibliography, from Annie Merner Pfeiffer Library Guide to Resources for the Study of West Virginia Authors and Literary Traditions. John Knowles, 75; Wrote ‘A Separate Peace’ by Elaine Woo. Los Angeles Times Archive, December 01, 2001. 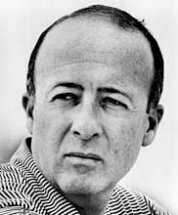 "Novelist John Knowles, whose 1960 book “A Separate Peace” became a modern classic for its sensitive evocation of adolescent conflict, died Thursday after a short illness at a convalescent home near Fort Lauderdale, Fla. He was 75." John Knowles - Background Information - Biography. A Separate Peace: Author information. 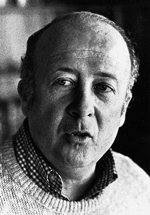 John Knowles, Novelist Who Wrote 'A Separate Peace,' Dies at 75. Knowles Obituaries. "John Knowles, whose coming-of- age novel "A Separate Peace" became required reading for generations of high school students, died on Thursday (Nov. 29, 2001) at a convalescent home in a suburb of Fort Lauderdale, Fla."
John Knowles from Wikipedia, the free encyclopedia. "Born on September 16, 1926 in Fairmont, West Virginia and died on November 29, 2001. He was an American novelist, best known for his novel A Separate Peace." A Separate Peace: A Special Time, A Special School. Essay by John Knowles, 1945. "The novel has one peculiarity for a school novel: It never attacks the place; it isn't an exposé; it doesn't show sadistic masters or depraved students, or use any of the other school-novel sensationalistic clichés. That's because I didn't experience things like that there. I found there a gorgeous world prepared to shape me up, and I tried to present and dramatize that." ‘Separate Peace’ author John Knowles dies by Terry Spencer, The Associated Press, Berkeley Daily Planet. "John Knowles leaves behind a legacy that included nearly a half-century of writings and nine novels, but none matched the success of 'A Separate Peace' — considered an enduring study of an adolescent’s inner conflict." Sorry, I can't seem to find any eBook or eText on A Separate Peace by John Knowles. But here are some copies of the book (some used books) you can buy for $0.01 or more plus shipping. Please send me an email if you come across any eBook on "A Separate Peace" available online. A Separate Peace (Paperback) by John Knowles. Used & new available from US$0.01, $3.99 shipping within U.S.A., from Amazon.com. A Separate Peace (Paperback) by John Knowles. Used & new available from US$0.39, $3.99 shipping within U.S.A., from Amazon.com. 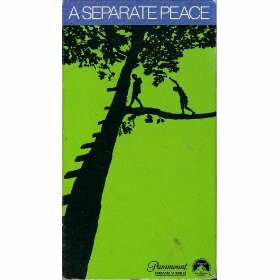 A Separate Peace (Paperback) by John Knowles Used & new available from $0.16, $3.99 shipping within U.S.A., from Amazon.com. A Separate Peace (ISBN: 0553280414) by John Knowles. US$1.00, $3.95 Shipping within U.S.A., from AbeBooks.com. Amazon.com 5-Star Reviews on A Separate Peace by customers. BrothersJudd.com - Review: A Separate Peace (1960). C+ rating. NationMaster.com - Encyclopedia > John Knowles. "A Separate Peace is widely included on high-school curricula. The novel's possible homosexual subtext continues to stimulate spirited debate ..."
Plot Structure Analysis,Themes Analysis - "A Separate Peace is a novel involving an adolescent's attempt to understand his world and himself. " Symbolism, Motifs, Imagery - "Knowles incorporates many vivid images into his novel. The first part of the book contains abundant pastoral images and descriptive passages." From Pinkmonkey.com, Monkey Notes. Review: A Separate Peace by John Knowles from Care's Online Book Club. What’s it about? Is it well-written? Why do you think this is on so many banned book lists? Review: A Separate Peace by John Knowles (Audio CD by Cindy Lombardo, Orrville Public Library, OH, from School Library Journal, Amazon.ca. A Separate Peace: A Process Essay on The Rites of Passage in John Knowles’ A Separate Peace by Sairalyn Ansano, Fahid Khawaja, and Taquonya Washington, Sophomores from Library.Thinkquest.org Arts and Literature, Academic High School. A Separate Peace: A Special Time, A Special School. Essay by John Knowles from Phillips Exeter Academy. Photo Essay. Web version of the photographic essay A Separate Peace: Moods & Setting, edited byThomas Hinkle, photos by Bradford Herzog. Reflections of John Knowles about his Novel: A Separate Peace. Perspectives on the Film. View Page from the Original Manuscript of A Separate Peace. A Separate Peace: Four Decades of Critical Response - in PDF, 7 pages (some double pages) by Lois Rauch Gibson, from University of North Carolina at Asheville (UNCA). "No feminist critics have yet commented on the paucity of women in the book, or on the negative image of those few who appear ... A few critics see Finney's very innocence as diabolical ... Both McGavran and Tribunella recognize what McGavran calls 'the continuing strength of homophobia and homosexual panic in Western society ..."
Why You Are Gay: "A Separate Peace". Blog from Blogspot.com, posted 14 Feb. 2007. About the Novel - A Brief Synopsis. A Separate Peace by John Knowles. Summaries and Commentaries, Chapters 1-13 from Education.Yahoo.com. BookRags: A Separate Peace by John Knowles. A Study Guide - Premium (cost for complete package, longer and more detailed articles). Book Notes - Free (short version). Contents: Author/Context, Plot Summary, Major Characters, Objects/Places, Quotes, Topic Tracking: Envy, Religion, War, Chapter Summaries. CliffsNotes: A Separate Peace by John Knowles. Free Online Study Guide and Homework Help. About the Author, About the Novel, Introduction, A Brief Synopsis, List of Characters, Character Map, Summaries and Commentaries (Chapters 1-13), Character Analyses: Gene Forrester, Phineas (Finny), Brinker Hadley, Elwin (Leper) Lepellier, Critical Essays, From Innocence to Experience, Gene and Finny: Doubles, Study Help, Quiz, Essay Questions, Practice Projects. GradeSaver: A Separate Peace - Study Guide contains a biography of John Knowles, literature essays, quiz questions, major themes, characters, and a full summary and analysis. MonkeyNotes: A Separate Peace by John Knowles. Free Online Study Guide edited by Diane Sauder. A Separate Peace Message Board, Downloadable/Printable Version of this MonkeyNote, Key Literary Elements: Setting, Character List, Conflict, Short Plot/Chapter Summary (Synopsis), Themes, Mood, Background Information - Biography, Historical/Literary Information, Chapter Summaries with Notes, Overall Analyses, Character Analysis, Plot Structure Analysis, Themes Analysis, Symbolism/Motifs/Imagery, Study Questions. NationMaster.com - Encyclopedia > A Separate Peace. Contents: Plot summary, Brinker Hadley, Elwin "Leper" Lepellier, Major themes, Allusions and references from other works, Film, TV or theatrical adaptations, References, External links. NovelGuide: A Separate Peace. Literary Analysis Categories: Summary, Character Profiles, Metaphor Analysis, Theme Analysis, Top Ten Quotes, Biography. Schmoop.com. A Separate Peace by John Knowles: Analysis, summary, chapter-by-chapter, themes, characters, notes, study questions, literature. A Separate Peace from Wikipedia, the free encyclopedia. Plot summary. Characters: Gene Forrester, Phineas "Finny", Brinker Hadley, Elwin "Leper" Lepellier. Major themes. Allusions and references from other works. Adaptations. A Separate Peace Study Guide from Bellmore-Merrick Central High School District, Long Island, NY and the English Department of Calhoun High School, Merrick, NY. SparkNotes: A Separate Peace. Context, Plot Overview, Character List, Analysis of Major Characters, Themes, Motifs & Symbols, Chapters 1-13, Important Quotations Explained, Key Facts, Study Questions & Essay Topics, Quiz, Suggestions for Further Reading. Character Notebook: A Separate Peace. Idea by Traci Gardner: "Analyzing the characters and their motives is crucial to your understanding John Knowles’ novel." See also Traci's List of Ten: Ten Character Diary Entries. Coming of Age. A Separate Peace, John Knowles - Theme: Coming of Age. Grades: 10-11. Language Arts, Novel Guides from ClassZone. Theme Openers: Graphic Organizer and Linking to Today: Group Discussion. Crosscurricular Activities, Research Assignments. Electronic Time Capsule: A Web Quest of the 1940s. A Separate Peace Web Quest by Cindy Adams. "It is now 2004--more than 60 years after Gene graduates and leaves Devon School. Imagine that Gene once again returns to Devon School and reflects on his experiences as a sixteen-year-old boy attending the preparatory school in 1942 during World War II." Glencoe Literature Library: Study Guide for A Separate Peace by John Knowles, in PDF, 22 pages. Meet John Knowles, Introducing the Novel, Before You Read, Focus Activity, Background, Vocabulary Preview, Active Reading, Responding, Personal Response, Analyzing Literature, and more. John Knowles Lesson plans for A Separate Peace from Web English Teacher. A Separate Peace. A WebQuest for 10th Grade Language Arts by Jade Bryant, Missouri Western State University (MWSU), St. Joseph, MO. "For this WebQuest, you will assume the role of Gene, the main character in the novel. As Gene, you will research the causes, events, and results of World War II, as well as the culture of this time. You will then analyze and reflect upon the action and conflict of your life and identify the ways you lose your innocence in relation to World War II events. Using this research and analysis, you will create a memory book that documents the events of the school year and how you changed throughout." 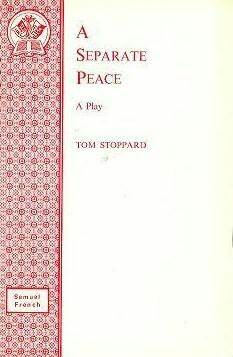 A Separate Peace: A Teenager Experiences World War II. A Web-and-Flow WebQuest by Sally Hursey. "You are a teenager living in the United States during World War II. You read the newspapers and hear the radio broadcasts, but it is hard to make sense of this war that involves so many countries and people. This webquest will take you back to the Home Front of the 1940's to learn what it was like to grow up during this turbulent time." A Separate Peace: A Webquest from English Department, Liberty High School, Colorado Springs, CO. "Fifteen years after leaving Devon School, Gene returns and reflects on his experiences as a sixteen-year-old boy attending the preparatory school in 1942 during World War II. Your job will be to create a time capsule for Gene that will help him remember the summer that changed his life." A Separate Peace & Film in cached HTML version as PDF is unavailable. In spring 2004, "disappointed with the level of engagement and the depth of analysis, I [Dan Gough] decided to switch from a creative writing focus to a film making focus, which would allow us to study film making techniques and apply these techniques to the novel in order to interpret and film scenes of our own. The audience for this unit is a tenth grade classroom in Wayzata High School [in Plymouth, Minnesota]. The unit is designed to encompass three weeks of instruction." 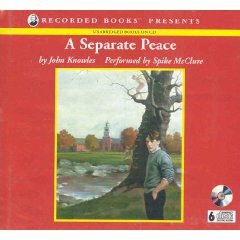 < HREF="http://litplans.com/titles/Separate_Peace_John_Knowles.html">A Separate Peace Lesson Plans & Study Guides for Literature by John Knowles. Links to Teaching Units, Teacher's Guides, Novel Unit Plans, Study Guides, and more for: Separate Peace by John Knowles. Include lesson plan resources for John Knowles, and literature resources for English Teachers in middle school and high school. A Separate Peace Unit Sheet by Amy Leskow, Help4Teachers.com. See also Dr. Kathie F. Nunley's Layered Curriculum® method of instruction. What's In a Layer? C Layer : : Basic knowledge, understanding. The student builds on his/her current level of core information. B Layer : : Application or manipulation of the information learned in the C layer. Problem solving or other higher level thinking tasks can be placed here. A Layer : : Critical Thinking and Analysis. This layer requires the highest and most complex thought. Create leaders, voters. A Separate Peace WebQuest by T. Mooney, a phenomenal reader and teacher. "This purpose of this project is for you to demonstrate how well you understand the concepts we have been talking about in class, and how well you make that understanding your own. You may choose one of three ways to complete the project: construct a web page, do a PowerPoint presentation, or do a traditional paper." A Separate Peace Webquest: The Importance of Setting by B. O'Sullivan, Lakeland High School, Shrub Oak, NY. "For this webquest, you will do some research on the historical setting of the novel and determine its role in the story." Study Guide for A Separate Peace by John Knowles - in PDF, 22 pages from Glencoe Literature Library. Meet John Knowles, Introducing the Novel, Before You Read: Focus Activity, Background, Vocabulary Preview, Active Reading, Responding, Personal Response, Analyzing Literature, Literature and Writing, Extending Your Response. Vocabulary from A Separate Peace by John Knowles. 73 words have been selected, listed alphabetically to encourage study. Web Quest: Lifestyles of the 1940s. Prereading Activity to John Knowles' A Separate Peace. "Based on the information you found, what do you think it would be like to live during the 1940s? Do you think young men and teenagers thought about the war back then the same way we think about the conflicts we are involved in today?" From Mrs. Monahan's Website for English & Literature, Fair Lawn High School, Fair Lawn, NJ. A Separate Peace: 1942 & 1972. "A Separate Peace" Interview from November 1972 Issue of Ingenue Magazine. Author John Knowles and stars Parker Stevenson and John Heyl talk about then and now. A Separate Peace (1972) from IMDb. Director: Larry Peerce, Writers: John Knowles (novel), Fred Segal (writer). Genre: Drama. Plot: Gene and Finny are two boys who are best friends living in 1943, at the height of World War II. Includes Full Synopsis. Cast: John Heyl- Finny, Parker Stevenson - Gene, William Roerick - Mr. Patchwithers, Peter Brush - Leper, and others. A Separate Peace (1972). New York Times Movie Review by Vincent Canby, Published September 28, 1972. "Larry Peerce's film version of 'A Separate Peace' is so good and true in small, subsidiary details of costume, music, weather and such that the ultimate banality of what it's all about is just that much more apparent..."
A Separate Peace (1972). New York Times Movie Review Summary. "Seven teenage prep-school students become young men as they face the realities of WW II in this drama set in 1942. Much of the tale centers on two roommates who seem exceptionally close ... But when one feels betrayed by the other, he acts out of anger and ultimately causes the other to become a cripple." By Sandra Brennan, All Movie Guide. Title: A Separate Peace. Running Time: 105 Minutes. Status: Released. Country: United States. Genre: Drama. A Separate Peace (2002). New York Times Movie Review Summary. "John Knowles' celebrated allegorical novel has been given a new screen interpretation in this made-for-cable adaptation. Gene (J. Barton) and Finny (Toby Moore) are two students at an upscale prep school during World War II; like their fellow classmates, Gene and Finny are trying to complete their schoolwork before they're drafted and sent overseas..." By Mark Deming, All Movie Guide. Title: A Separate Peace. Running Time: 91 Minutes. Country: Canada. Genre: Period Film, Psychological Drama, Coming-of-Age. Identity in A Separate Peace, by John Knowles by Elizabeth Wordsmith, from Helium.com. "Adolescent Identity Struggles as portrayed in A Separate Peace. Adolescent identity vs. society's expectations is a major theme of John Knowles' post war novel A Separate Peace. ... A Separate Peace is a novel with universal lessons about the fragility and pain of adolescent ego identity formation." Separate Peace Essay: Self-Examination in A Separate Peace from 123 HelpMe.com. "Knowles' book focuses on the adolescent period of life. Adolescence is a very confusing time of life, primarily because a person fluctuates from wanting to be a child and being innocent to wanting to be an adult and questioning life." See also Knowles, John 1926–: Critical Essay by James Ellis free excerpt of 185 words from BookRags.com. A Separate Peace: The Fall from Innocence by James Ellis. First page of article published in the English Journal, May 1964. See full article Access Options. A Separate Peace: 37 Quotes from Chapters 1-13, from Book Notes Summary, BookRags. A Separate Peace: Important Quotations Explained from SparkNotes. A Separate Peace: Important Quotes and Phrases - in PDF, 4 pages from Teacher Pages, CIBACS (Center for International Business and Communication Studies). A Separate Peace: Top Ten Quotes from NovelGuide. American Writing Gateway: John Knowles: A Separate Peace. Website Evaluators: Chris Huber, Wink Rush, Websites Reviewer and Compiler: Charles R. Sanders. EdHelper.com - Literature Unit: A Separate Peace by John Knowles (Grades 9-12). Knowles, John: A Separate Peace: Novel Information and Resources. Novel Links gathered by Sirpa Grierson.